en-net | Is mortality survey a must to be conducted along with SMART? Is mortality survey a must to be conducted along with SMART? In every SMART survey, I am looking mortality assessment attached to it. is it a must? Unless the situation is emergency where there is no information or unless there is a signal or an indication of disease outbreak, I don't see its important. so, isn't it possible to do just case by case? A typical "SMART" type mortality assessment cannot distinguish between these cases. The survey will give the same estimate (marked "average" above) for each of these scenarios which may have applied some time in the past (some have this as the mid-point between the start of the recall period and the survey date). 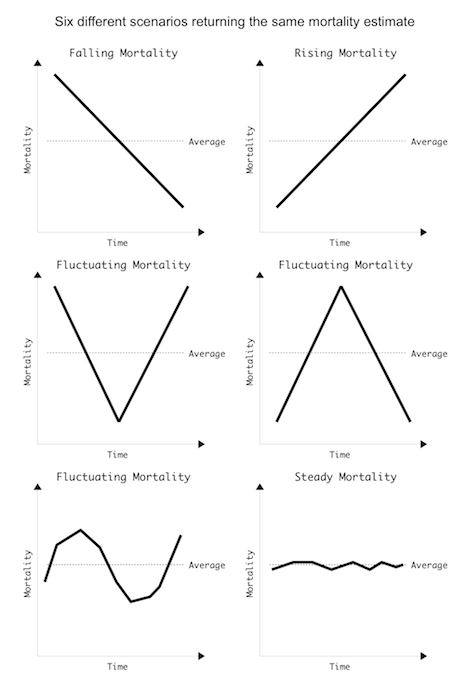 The method cannot tell you whether mortality is falling or rising. A mortality survey provides the least useful data of that provided by the SMART components and is difficult to do right. Probably best avoided. Decision on whether to conduct a retrospective mortality survey alongside the nutrition one should be based on needs. Many would argue as well that conducting a SMART type nutritional assessment is also only for emergency settings. If you are conducting this assessment in order to define the needs for a CMAM program, then mortality data may not be necessary, but if you are conducting the SMART survey as part of an annual monitoring of the nutritional status of a targeted area, then it could be useful to systematically add a mortality survey, as well as to collect other indicators in the health, WASH or food security domains. Conducting a retrospective mortality survey alongside the SMART does not increase signficantly the cost of the survey and can also provide very useful insights on the main causes of mortality in the population you are targeting, which in turns will give you a better understanding of the population you are serving. In most areas, no reliable mortality data exist so conducting this mortality assessment would provide information useful to other actors as well. I would therefore recommend to conduct it. I broadly agree with David. A broad range of indicators collected in the main SMART survey is useful. Some indicators (e.g.) WASH will have large design effects but SMART survey sample sizes are usually large enough to still return estimates with useful precision. Some indicators will not be feasible to collect with SMART surveys. I am thinking specifically of the WHO proposed IYCF indicators which are best suited to large sample surveys such as MICS and DHS. I am sceptical about reporting causes of mortality because (1) we are usually forced to rely on folk diagnoses and (2) sample sizes will usually too small to capture variation or rank by frequency. If, for example, mortality is running at 1 / 10,000 / day and you have a recall period of 90 days with a sample size of 4000 (i.e. about 7 people per sample HH) then you would expect to see about 36 deaths. That is quite a small number to work with. Better than nothing but still small. I think you are limited to (as David says) reporting the "the main causes of mortality in the population you are targeting" but I think you could get that by other (simpler, quicker, cheaper) means.